If you have any questions or want to enquire about dates, use our form to contact Jens Bachem or see their website for more information. Jens and Michelle, who live nearby and settle you in, have transformed this modern house into a wonderful escape for families. Floor to ceiling sliding glass doors and huge windows let you gaze out to the lake and mountains beyond – a soul-soothing sight. Inside all is airy and spacious; the simple, beautiful décor is an unfussy mix of old and new: splashes of colour from local art on white walls, Persian rugs on pale hardwood floors, a beautiful Irish antique carved bureau. The house is on one level with the living/dining areas and kitchens all lake-facing; the calming bedrooms (except for one double) face the garden. The open-plan kitchen/diner/lounge is the hub of the house for all to gather for late breakfasts, lazy lunches and simple suppers. Spill out to the large kitchen (you’ll find all you need for serious cooking; or onsite catering can be arranged), formal dining room and lounge when the occasion or mood takes your fancy. The approach alone, down a long wooded road, will blow the cobwebs away. Add to that your own private lakeshore, a verdant garden and heaps of outdoor activities to leave you feeling utterly soporific. Minimum stay: 3 nights, 7 nights in high season. Caragh Lake House is a gem in itself and when you combine that with the hospitality of Jens and Michelle and the beauty of the location then you really have somewhere special to stay. We can't recommend Caragh Lake House enough. The exceptional website doesn't lie. 3 days wasn't sufficient....we'll be back! 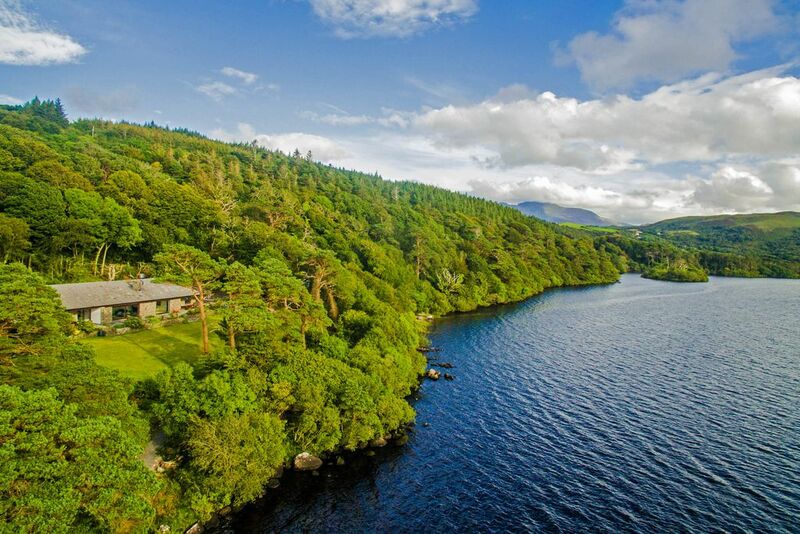 The house is beautifully situated, right on the shores of Caragh Lake, a large scenic lake set within a Special Area of Conservation that includes Killarney National Park, Macgillycuddy's Reeks and the Caragh River Catchment. Half an hour by car from Kerry Airport, seven minutes from Killorglin - a bustling market town and a short drive from Rossbeigh - a beautiful Blue Flag beach, Caragh Lake House is the perfect base for your vacation in this fabulous part of the world. Swimming, boating, canoeing, stand up paddle boarding, fishing, hiking, cycling, yoga... these are all available, right on your doorstep. You can also go surfing, mountain climbing, deep sea fishing, foraging, play golf and much much more. For food shopping, Killorglin is just seven minutes away. With three supermarkets, four local butchers, a fishmongers, organic food shop and artisan bakery you can pretty much get everything you need to cook up a delicious meal back at Caragh Lake House. If you feel like dining out there's a fantastic choice of restaurants. Killorglin boasts everything from fine dining to delicious bistro food. Caragh Lake has two high end restaurants and Cromane a seafood restaurant with views of the Atlantic. If you prefer to stay in but don't fancy cooking, we can organize for one our selected local chefs to prepare a delicious meal back at the house.